Being a person who loves to explore one of my favorite things to do is wander about until I find a place that intrigues me. Pye Noodle and Tea and Milk were two of them. Astoria is a neighborhood I have yet to fully explore, but I'm looking forward to more delicious food. L: Roasted oolong with signature cream. R: Hibiscus white peach with chia seeds and aloe. Have any favorites in Astoria? I'd love to know. I have visual goodies for you guys! This will be part one of the photos taken from my mom's birthday. Last month my brother and I celebrated our mom's birthday at Cookshop. It's been quite a while since I've been and this trip reminded me why I love the place so much. I hope you're not hungry, cause this post might make you more hungry! Do you prefer seasonal restaurants? Check out Cookshop at 156 10th avenue, on the corner of W. 20th. If I had to pick my top five favorite cuisines, Thai is one of them. With one of my fave Thai places closed down I'm still on the lookout for good, authentic Thai. I think I'll be adding PURE to my list... And the cheesy Thai pop music is a plus. PURE Thai Cookhouse can be found between 52nd and 51st on 9th avenue. The day after my birthday was truly a day for the senses. It was uber windy in West Village and before heading to dinner we spent a good amount of time at Anick Goutal, taking in all the wonderful smells. It was still a little chilly so I dressed up in layers. My outfit was simple, but I left it up to my accessories to add a little bit more oomph. I always pass this beautiful tiled mural when wandering Greenwich, the vibrant blue just evokes that rustic European charm. Definitely one of the hidden gems we have in Manhattan. As for Spain...It's somewhere where I've always dreamt of going. And Salinas has brought a little bit of Spain to New York City. When I walked in, I was overcome by the amount of flowers that they have in the restaurant. They're everywhere! The flowers were so fresh and so fragrant, I wished that I could take one (sadly, you can't). There's an additional fee ($15) for taking a flower, but that shouldn't stop you from visiting. These flowers are flown in once a week from Portugal, so they're pretty special. View from our table. We were lucky to get a corner booth table. For drinks we decided on sangria, available by the glass or pitcher. My brother and Siu ordered the sangria roja and I ordered the sangria seca rosada. The sangria roja was made with Spanish red wine, brandy, orange liquor, and peach liquer. The seca rosada was made with Spanish rose, black pepper infused vodka, orange liquer, and peach liquer. If sangria isn't your fancy they have a variety of cocktails and wines. Next time I'm planning on some cava. For our appetizer, we ordered the plato charcutero which contained a variety of cured meats, served along with their eggplant-fig compote and bread crackers. In addition to this, we also ordered Iberico ham and a half-ounce of Manchego cheese. I couldn't name which meats were which, but they're all different. One was smokier, one was spicier...it was a flavor explosion. With the spanish guitar and lounge music playing, I was ready to book a flight. One of the best parts of our meal, even though I loved it all, was the paella. For all my paella lovers, it's one worth trying. The way it works at Salinas is that it's charged per person, about 30 dollars. This works perfectly so you don't get too little or too much. We ordered the Nuestra Paella with bomba rice, free-range chicken, sepia, sea scallops, head-on prawns, clams, mussels, and chorizo. They also offered an option to make it more authentic, by having the rice a little crunchy. The rice was still soft, with a little added bite-- the texture makes a difference. Can you guess which dessert was mine? The one in the middle was, even though the one on the left has the candle (oops). No worries though, all the desserts were delicious. If it's yours or a loved one's birthday, mention it if you make a reservation. Their small desserts packed a punch, with the focus being flavor and presentation versus size; it felt much more special. Salinas' coffee was not the typical machine brewed cup o' joe. Thick and frothy, their coffee is flavorful and strong; it made me want to get up a little early every day just to use my french press. The coffee was served along with milk and if you're not a black coffee drinker like myself. The fun part of the after dinner coffee: frothed milk. We had to scoop the milk out and plop it onto our coffees. What Chef Luis Bollo has done is bring a little bit of Spain to NYC. If you're looking to take a trip for your senses check out Salinas. Plus, it's intimate and romantic; perfect for date night. P.S. I'm trying to convince my boyfriend to take me here (here's to hoping!). *Photo cred to my brother and his awesome iPhone 6+ et moi. This post is a throwback, going way back to my brother's birthday. His birthday was in August, smack dab in the middle of summer. We trekked out on a hot and muggy day, definitely a day that called for comfort. But comfortable doesn't need to be boring, gone are the days when these two words were joined. This brings me to my outfit of choice on that day: comfortable, simple, and effortless. Wearing something tight on an extremely humid day is a no-no, unless, you can bear it or already do (props to you). I steered towards throw-on pieces -- jeans and a tee, with a twist. Everything I was wearing was mine, minus the belt; it's my brother's. These two are closet staples and essentials; everyone has jeans and a tee. It's what you do with it that turns it into something okay, or something wow. Add your personality and make it your own. Before I get to the birthday brunch, I have a little funny story to tell. First things first, ever watched The Wedding Planner with J.Lo? If you haven't, go and see it; it's a cute rom-com. But movie aside, I had an iconic Wedding Planner moment, i.e. getting my heel stuck in a grate. Even better, a worker with a trashcan, along with a huge crowd of people was headed towards me. Talk about adrenaline pumping! So, future note to self and readers: no stilettos when walking the High Line. Now, on to the food. We had brunch at Cookshop, a greenmarket-driven restaurant that's not even a couple of blocks from the High Line. Starting off with drinks, they have a good-sized drink menu -- alcoholic and non-alcoholic. Siu and I opted for fruit mocktails, mine wasn't as sweet for a reason: jalapeños. Yes, you read that right, jalapeños. I've never had a spicy, fruity drink before, but it wasn't too spicy that it was off-putting. If you visit and they have it, give it a go. Our appetizer was their lemon curd beignets. I've never had beignets before, real beignets from New Orleans. But, if they taste like these, I want more. Not too heavy, and still light and airy, these were little pockets of sunshine. The meyer lemon curd was tart and refreshing-- perfect for a hot, muggy day. Siu and I went the sweet route, while my brother went with savory. Either way, you're bound to get something delicious. My pancakes were huge; I don't think the picture do them justice. If you're worried about the ricotta (cheese, in pancakes!? ), you won't taste it. Think about it as a flavor enhancer, for both the lemons and blueberries. Like the drinks, the french toast was sweet and tart. Add in more depth with the pecans, giving the meal a nutty and roasty flavor-- perfect with the sweet and tart peaches. My brother's salmon egg hash was perfectly flavored with a variety of herbs, and they didn't skimp on the smoked salmon. The biscuit served with his meal was soft, break-apart, buttery goodness. I love the greenmarket and rustic approach to Cookshop's food. You can just tell when something's made in a cast iron skillet or griddle. Not going to lie, a part of me felt like a cowboy whilst eating. Maybe it was the decor, music or cast iron but all of this evokes an American Western charm. So, I guess I'm calling this good ole' cowboy food, just taken up a notch. *Note: Cookshop changes their menus seasonally, some items may, or may not still be on the menu. This past week I've been downtown for my food cravings. But the wonderful thing is that you don't know what you'll find; and that's what downtown left me with. A lot of people have their usual hangouts- coffee shops, bars, restaurants, etc. The usual for coffee downtown is The Bean, but due to the freezing weather (we're at 20 degrees now!) it was packed. My boyfriend and I checked out other ones within the area with no luck. But luckily, we found Everyman Espresso with one table to spare. It's one of the quieter coffee shops I've been to (maybe off hours? ), but I definitely enjoyed it. 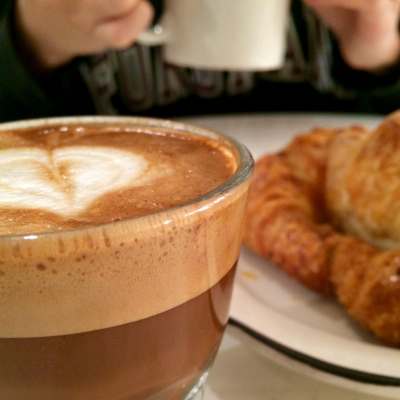 We managed on: one ham and cheese croissant, soy cortado, and a café mocha. An hour or so later, we wondered why we've never discovered this place before. I loved the addition of the various playbills and papers on every table- they acted as the perfect props for my photos. They know us bloggers and instagramers so well! But we can't all survive on coffee alone (though it does help). I finally paid a visit to Beyond sushi, somewhere where I've been dying to go. I've been meaning to get back into my healthy vibe for quite some time, and I thought some vegan sushi would do the trick. Now some are skeptical (including my friends)- "What is vegan sushi?" and "Is it even good?!" It was good boy was it good. I wanted something tropical/beachy and decided on the spicy mango roll. My friends had the La Fiesta and Mighty Mushroom roll. The greatest feeling (asides from eating well) was that my friends thoroughly enjoyed it. I'm happy to share with others that healthy food can be delicious too. Beyond Sushi has become an instant favorite, I'm thinking about it right now! Their sushi is definitely a culinary inspiration and I'm looking forward to giving it a shot. Maybe some recipes in the future? Hey guys! I hope everyone had a wonderful Halloween and weekend. Sorry for being MIA... my Halloween plans left me exhausted and with a slight cold. It's been a tea and Emergen-c kind of weekend. I think it's the constant change in temperature; right now it's hard to decide on what to wear. But I think the best solution is to dress in layers. Blue smoke is not only the name one of my favorite restaurants, but it's also the color of my coat. It's something I immediately reach for when it gets nippy. It's not only warm, but also a statement in itself. I love the extra edge it adds to whatever I'm wearing. After the photo shoot with my friend I headed down to East village to meet my boyfriend for lunch. He took me to Weschler's- a place known for their beer and brauts. Pretzel with their homemade mustard. We didn't get beer, but we did try an assortment of what they had to offer. I got the platter that comes with two brats of my choosing and two sides (pretzel and sauerkraut). My boyfriend decided on a pork and veal sandwich, fries, and pretzel on the side. No sauerkraut for him (he hates vegetables). The place was intimate when we went, but my boyfriend said it can get pretty packed in the evening. I'm looking forward to trying one of their dark beers and their famous currywurst next time around. Before ending the day, we spent a good amount of time at The Bean. Every time we head over to The Bean it's always full, there's only been another instance in which we actually got a table. We considered ourselves lucky, especially since it was Halloween. Other than Starbucks, if a Bean is in the area more often than not you'd find me going there instead. They really know how to make a mean cappuccino. Since it was Halloween everyone was dressed up, including some of the workers. Children also came and went trick-or-treating, alas no coffee for them! The cherry on top was the dog dressed up as Chewbacca. What did you guys do on Halloween? My brother and Siu surprised me with a trip to Oyster Bay for the 31st annual Oyster Festival. We took the LIRR and it was an about an hour ride. It felt like Summer all over again-with carefree days spent with good company. I consider this the last hurrah for Summer even though it's gotten pretty chilly and it's already fall. Oysters and fresh seafood just scream Summer. There were various family friendly rides, but the main attraction for us was the food. We started out with Wild Bill's Olde Fashioned Soda. Their sodas are homemade and made with pure cane sugar. When you buy the mug you get unlimited refills throughout the day, we purchased the insulated mug to ensure our drinks remained cold. The flavors included orange soda, birch beer, root beet, sarsaparilla, diet root beer, ginger ale, and vanilla root beer. The sarsaparilla and root beer were my favorites. The mugs are quite big but it makes for a good souvenir. Lots of people at the festival had them, and more than once was I asked whether it was alcohol (not here folks!). I believe drinking was allowed but only off the festival grounds, but there were other non-alcoholic beverages available if soda's not your cup of tea. The kettle corn was so good I forgot to take a picture! They had samples of each flavor available but I enjoyed the simplicity of the sweet and salty. As for the pretzels, the pictures don't do them justice. They're huge! I'd say as long as a person's face, and the pretzel was bigger than my brother's. They made the pretzels throughout the day and had them grilled before handing them out to customers. This is what I wish a NYC style pretzel would taste like. They oysters were served with cocktail sauce, but there was a wide variety of condiments. I enjoyed them the best with a squeeze of lemon, yuzu sauce, and the spicy Korean cocktail sauce. These were definitely worth the hour and a half wait (eek! ), I could have eaten WAY more than five (you can't just have one). We were tempted to get back on line to get more oysters, but the line got even longer towards the end of the day. There were two adorable Alpacas, and I only got one of their names (Bella). I got to pet her and they were very friendly and sweet. Initially Siu and I had thought they were toys, they were so still-then they moved! Lots of blankets, vests, and other clothing items were sold by the farm. We also ended up seeing lots of unique things such as handmade lace and artisanal cooking and baking mixes. The handmade lace was all made by this sweet woman, who not only made doilies, but shawls, hangers, and anything you could imagine. We didn't get to try the English pastries but they were selling out pretty quickly (missed out on the black currant cake). But I ended up purchasing a few cheesecake mixes and dip mixes that I plan to make soon. The booth that sold the mixes are based in Vermont, they have their own Inn which has outdoor and indoor activities. If I ever get to go I was to try kayaking and their cooking classes. If their mixes were delicious I could only imagine what the food at the inn tastes like. I love coffee shops. There's something about the intimate setting that can spark unexpected conversation. Earlier this week I had the opportunity to finally visit Rex; I've been wanting to stop by for quite some time. Rex is small compared to some Starbucks', but makes up for it with the music, atmosphere, and coffee. My friends and I tried their cortado as well as their cookies (chocolate chip and peanut butter). Their cookies were flavorful and moist and I'm looking forward to trying their other baked goods. As for their cortado, it's one of the best ones I've had other than Abraço's in East Village. When the Starbucks or my favorite café is crowded I'll definitely be stopping by for some good coffee with a book intact.